Most guitar students who come to you for lessons will be beginners...so you'd better know how to teach them effectively if you want to stay in business for long. These resources will show you the best ways of teaching guitar to beginners. Learn more. Learn how to easily know what and how to teach your students at all times, to help them get better results faster from you...without you working an extra 40+ hours each week preparing new lesson content. These guitar teaching resources will show you how easy it is to do this. Learn more. Most guitar teachers are lucky to earn $35,000-40,000 per year...the most successful ones earn multiple 6-figures per year. Study the resources on this page to learn how you can easily earn 6-figures teaching guitar (working part-time!) Learn more. Save yourself years of frustration by avoiding the most common mistakes that guitar teachers make. Study the resources on this page to learn the right way to teach guitar, so you can become the #1 guitar teacher in your area. Learn more. Getting more guitar students starts with asking yourself the right questions. These questions shape your guitar teaching business strategy and help you take the right actions that fill your guitar teaching schedule fast. 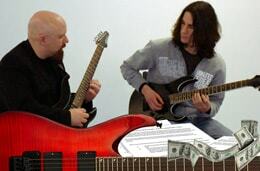 Read this article and learn 6 guitar teaching questions that help you get more guitar students. Wish you had a lot more guitar students in your teaching schedule? Then you absolutely must learn how to make your guitar lesson ads highly effective. Discover how you can get a lot more guitar students while earning tons of money in your guitar teaching business by staying awaying from the 4 most mistakes guitar teachers make in their guitar lesson ads. How Good Are You At Attracting Guitar Students? Take this 2 minute quiz to find out exactly where your current approaches to getting guitar students are failing. After you take the test, I will give you my expert feedback (for free) on what you can do better to attract more students into your guitar teaching schedule. Test how much you know about attracting guitar students. In addition to all your normal marketing, there are 6 steps you must take when talking to prospective guitar students in order to: make them see you as the ‘only option’ for them, inspire them to remain with you for a LONG time, and tell their friends all about you. Learn how to do it in this guitar teaching article. Learn how you can keep a full schedule of students during the summer while your competition suffers and their rosters dwindle as fewer students inquire about guitar lessons. This article shows you the 4 reasons that most teachers lose money over the summer and how you can not only maintain, but grow your guitar student roster during the summer. Wish you could get more guitar students aren’t experienced enough or live in a small city? Fact: getting a lot more guitar students actually has little to do with your location or teaching experience. Learn what you need to do now to get more students using this free resource on how to get more guitar students to take lessons with you. Learn all of my very best strategies, tactics, tools, techniques and secrets for filling your guitar teaching schedule and have students choose you over any other guitar teacher in your area. These are the very same methods I’ve used to become the dominating guitar teacher in my town (years before I started teaching online) and that I’ve trained hundreds of guitar teachers to use to build their highly successful businesses and music schools. Learn how to attract guitar students like crazy. Getting lots of guitar students is only ONE piece of the ‘guitar teaching success puzzle’. Go far beyond simply having ‘a lot of guitar students’ and get real training on how to build, grow and sustain every aspect of a massively successful guitar teaching business. Learn how to make 6 figures per year teaching guitar, work (a lot) less than 40 hours per week, help your students become great guitar players and live the life you’ve always dreamed about. Sounds unrealistic? Many of my Elite Guitar Teachers Inner Circle members are already doing it and they got that result by using my proven and extremely effective guitar teacher training strategies and methods. Becoming the most successful guitar teacher in your area is DEFINITELY within your reach, and if you are committed to getting this result - I will commit myself to getting you there. Read this page about personalized guitar teacher training.